There is nothing around you, just a white void. 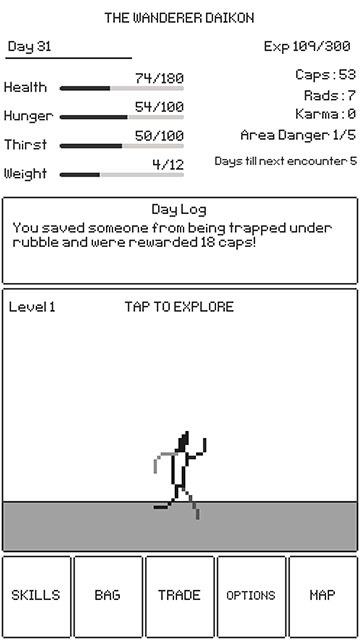 You enter this survival game without knowing what has happened or where you are. You just know that you have to survive and it seems that just quite like it is said in the quote of Albert Einstein “I know not with what weapons World War III will be fought, but World War IV will be fought with sticks and stones.”, you’ll start with almost nothing. As seen in the post-apocalyptic survival shooter “Fallout”, (bottle) caps are your only currency that you have to collect and reinvest in food, water, medicines, bullets or more. Let’s see how far I’ll come! Doing everything to improve my Karma points. This whole game has a minimalistic approach. You know nothing about the background story or the place itself. The game menu and screen are monochromatic, and besides the main character there are no pictures or pictographs. It might not sound too appealing, but it truly is! The simplicity is calming, yet the music is somewhat haunting and fits right into the setting. The randomness of happenings and things that are buy-able make it interesting and I always find myself saying that I just try for another five days and then another five and so on. 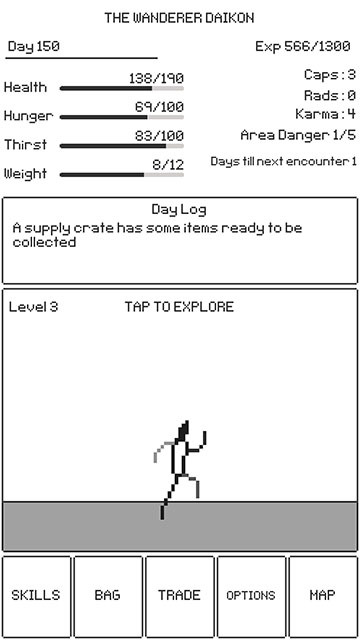 It is surprisingly addictive even though it is a simple and clean looking text adventure. While the minimalistic design has its appeal, I would like to see a bit more action and possibilities. I can imagine to find new ingredients and to craft them into food with different nutrition aka bonus stats. Or have the different characteristics of temperatures and places involved. Another thing that I would like to see improved is the color scheme. While I love the used hues, it sometimes makes it hard to interpret them. For example, if I bought some water the field becomes gray. In the beginning I did assume, that I can’t buy any more of this item, because it is grayed out. But you can buy multiple items if you have enough caps. A different coloring would make that clearer. Lastly, even though the sounds and music are fitting, I would love to have a mute option, so I can listen to my own music while playing. Odds are that I’ll survive a bit longer. Give this well-rounded game a try and download it here. It is even free since one of the last updates. Hi Jamie here, creator of The Wanderer. I have sent you an email, wondered if you received it.